We first became aware of rods when we lived in Arizona. I think that's because the air was still clear there and after living for years under the polluted skies of Michigan, we fell in love with things over our heads all over again. That was in 1996-98. We spent a wonderful three years in the high desert regions of Northwestern and Midwestern Arizona. During that time we marveled at two passing comets, a full eclipse of the moon, unusual planet alignments, and a variety of other anomalies, including an examination of some ultra-bright "stars" that twinkled a little too brightly. We discovered they were satellites circling the skies over our heads. We were amazed that we could see the Milky Way again. By day the Arizona sky was usually always a bright crystal blue, unless a storm was building. Storms came mostly during the monsoon season. Then the approaching cloud formations were so clearly defined against the blue the contrasts might have fallen right off a painting by famed Dutch artist Vincent van Gogh. It is small wonder that human awareness of the rods, like our own, has been nil. A friend brought them to our attention. Observing a rod is very difficult. They move so fast it is almost impossible to see them with the naked eye. But cameras with fast shutter speeds, and movie and the new high contrast video cameras are catching them. And they are everywhere. It seems that Jose Escamilla is credited with catching the first officially recorded videotape of a rod in flight in 1994, while shooting pictures near Roswell, New Mexico. At about the same time Escamilla was making his discovery, a young man named Jeff Ferris was also videotaping rods shooting over his Tempe, Arizona home in broad daylight. The two men puzzled over the rods, wondering if they were an alien life form, a strange energy, or something else. Ferris produced a filmed documentary about the rods titled: Rudimentary Rods: Mysterious Objects Among Us. 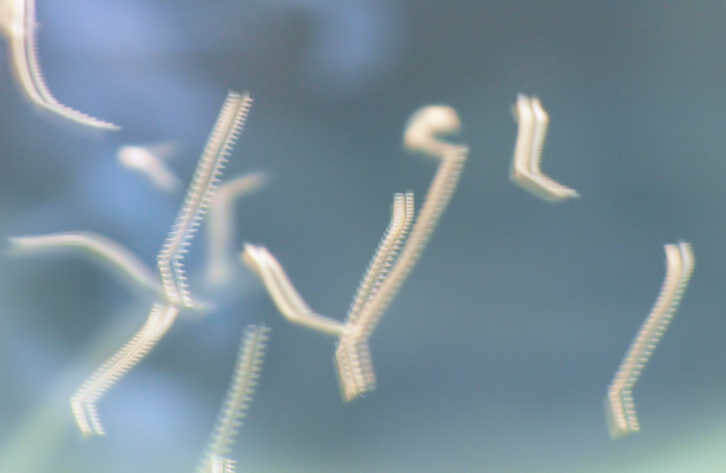 Some skeptics who have examined the pictures suggest they are insects, or birds, flying close to the camera lens. But Ferris won't buy that. His description of his first rod filming is so spectacular and so strange that it seems quite clear these were not pictures of something flitting past the camera lens. "I was skating on a backyard ramp and I set the camera up on a stool," he offers. "When I played the tape, there was [a Rod] that I got that comes over the top of the ramp and goes in between our heads and down past the camera," he said. Our friend agreed that the rods appear to be some intelligent life form that shares this planet. He says there are literally millions of them moving at an ultra high-speed past us and over us all of the time. They are somewhat long and thin in shape; think of crooked cigars? They seem to be capable of bending and changing course at will. He said he has observed rods that appear to be on a collision course with a hard object, but just before they strike, they make a quick detour and zip around the object before continuing on their way. It is almost as if they have a bat-like sensory system similar to radar that lets them know something is in the way. The decision to change course at such lightning speed is a clear sign that rods may be an intelligent life form. While researching rods on the Internet, I found a report written by an unknown author who claimed he observed rods in the late 1970s while throwing boomerangs in his yard in Phoenix, Arizona. This person said the rods appeared to follow the boomerang as it made its arch flight. At the time he thought of them as dragonflies, except that they were moving extremely fast. It was not until he saw the Ferris video that he identified the things he was seeing as rods. "The best time to see them was late evening just before sunset. The shadows of the houses on the west end of the parks would cast a shadow over the park and sunlight would still be on the tops of the tall trees in the park. The sun would reflect off of the boomerang and "things" best at this time," he wrote. Rods do not appear to be very large, but that may be an error. If flying past from a great distance, there could be giant as well as tiny rods measured in inches. Some are a gray color. But white ones also have been photographed. I have no conclusion to this report, except to say that the rods are just one more proof that the world we live in is shared by multi-dimensional life forms. While the rods appear to fly in our three-dimensional environment, I suspect they may come from either two or four-dimensional existence.